I was so inspired by the gorgeous photos of flowers over at Attic24 that I went out for a walk yesterday, digital camera in hand, to get some wildflower shots. It was the first weekend in almost a month without rain. I love rain, but was so ready for sunshine. My first stop was at Guadalupe Oak Grove Park, a tiny little piece of heaven with 200-year-old oak trees and colonies of Acorn Woodpeckers. The people are friendly at that park. I'm still getting over a cold, so I was coughing a bit. A man strolling by me asked, "Do you know what one casket said to the other casket?" When I said I didn't know, he replied, "Is that you coffin?" 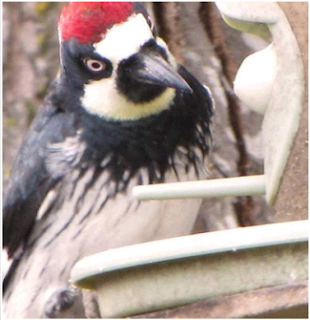 I tried to get a shot of an Acorn Woodpecker, but couldn't zoom in close enough. The funny thing is, DJ Pettitt posted this close-up of one on her blog yesterday. She mentioned that she used a Canon Power Shot 20X, which explains why she was able to get in close and I wasn't-- mine is an 8x. This is my bench. I like to sit here on weekend mornings, with a bagel and a bottle of Starbucks Frappuccino, and watch the birds. One day, a bobcat walked right past me. I saw him coming out of the corner of my eye, and my heart skipped a beat because he was so big I thought he was a mountain lion. But before I could go in to full-on panic mode, I noticed his bobbed tail. Phew. I sat perfectly still, avoiding eye contact, and he moved right on by, not at all interested in me or my bagel or the Frappuccino. A little later yesterday afternoon I headed over to Almaden Quicksilver Park. I used to hike there so often that I felt like I owned the place. Then I got rather, um, out-of-shape and had to relinquish ownership. We have mountain lions in the game reserve here in the NE - scary because, well, we all know cats. I can see how this walk blessed your day. Thanks! What a gorgeous place... such beauty. I'm in love with that 200 year-old oak! I covet the acorn caps it must produce! Your photos are all stunning, thanks for sharing on Friday's Nature Table.